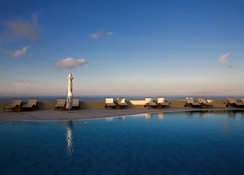 The Majestic Hotel Santorini has been welcoming guests since 2005 and offers 61 luxurious rooms. Offering excellent views of the Santorini mountain range, the hotel is perfect for those looking for a relaxing holiday in Greece. The air conditioned rooms are well appointed and come with an en suite bathroom, a direct dial telephone, satellite/ cable TV, an internet connection and a stereo. They are also fitted with a minibar and a hire safe. The three swimming pool, one heated during winters, are inviting and fitted with sun loungers and parasols around them. The two restaurants – one gourmet and the other a la carte serve a wide range of delicacies from around the world. The hotel also features a playroom with facilities for billiards and darts. There’s a fully equipped fitness centre, a sauna, a steam room and a children’s playground within the hotel’s complex, which is wheelchair accessible. Private parking is possible at the hotel premises. 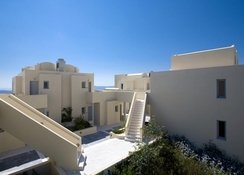 The Majestic Hotel Santorini is situated only a few minutes' walk from the town centre of Fira Sea. Perched a few hundred metres from a cliff, the views offered by the hotel are commanding. The closest beach lies around 6km from the hotel. Guests can rent a car or take the public transport to visit most historic sites of touristic interest on Santorini. This is a wonderful place to relax after a long day exploring the island. The Perissa Black Sand Beach, which is a unique one, is 10.6km from the hotel. The Santorini Airport is hardly 5km from the property, making it easy for guests to reach the hotel and board their flights back on time. 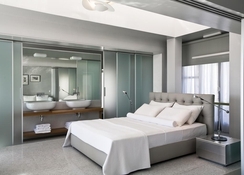 The 61 guestrooms at the Majestic Hotel Santorini are categorised as master suite, east sea view room, volcano sea view room, maisonette sea view room and rooms adapted for physically challenged guests. The luxurious soundproofed guestrooms come with relaxing king size or twin beds, spacious bathrooms fitted with bathtubs and terraces offering excellent views. The Majestic Hotel Santorini houses a superb gourmet restaurant as well as an a la carte restaurant. Between the two, the restaurants serve a variety of cuisines from around the world. There’s also a pool bar that serves light bites and delicious cocktails. Guests can avail room service from 8am until midnight. 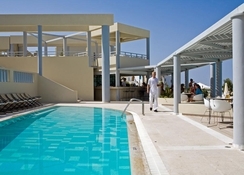 The Majestic Hotel Santorini features three swimming pools, one of which is heated during the winters. Fitted around the pools are sun loungers and parasols – perfect for sun bathing or simply relaxing with a delicious cocktail served by the poolside bar. The hotel offers its own sauna, Jacuzzi as well as spa and massage options. The state of the art gym helps guests stay active during their holidays. Recently spent a week in the Majestic Hotel and it was lovely. Staff couldn't do enough for us, place itself is spotless and in a great location (10 minute walk to Fira with its selection of shops and restaurants). Accommodation was adequate for four of us. Not ideal if you want a beach hotel unless you hire a car.